Months before I began “GAGA - A Portrait Series” I conjured an idea to create a portrait oeuvre inspired from films like The Matrix and Minority Report. I wanted props! Broken down devices, microchips, glass, cables and cords. Something you would see in a outer worldly music video or high-budget movie. But, I also wanted the fashion and wardrobe to shine and come out through the photography. I wanted to create a brand and staple, something recognizable and pieces that speak louder then words. Now, with the response I had received on GAGA, I had to step up the game. When I approached a few friends and peers about the idea, I didn't receive much feedback, so I shelved it for a later time and moved forward with GAGA. At some point after the new year(2012) I started doing some serious brainstorming, I decided to connect with friend and fashion designer Scooter Ray with the idea. After a series of phone conversations we aptly titled the project “EPIC”. He was on board and I was glad to have his excitement behind the concept. 1. We will be shooting this as a SERIES. The line is so fantastic that we want to focus on each outfit individually. The series will include 3 female models and 3 male models. 2. We will be shooting ONE model at a time. Most all of Scooter’s designer lines are shot in one day, with 3-6 models and is usually hectic. We want to really focus on each piece and each model and spend the time to really make this line shine. 3. Each model will have two looks on their shoot, a high-fashion “euphoria” look and then a manic and broken down “unhinged” look. 4. Every shoot will be studio based. Scooter’s clothing has never been shot in a studio, so we really want to bring it back to basics and counterbalanced with some interesting props and modern digital photography techniques. 5. These outfits will be sold online. June 8th, 2012. Day of the shoot. Surprisingly I wasn't nervous at all. With the blueprints we had drawn out, I felt very prepared and working with one model and two looks was a breeze. My goal? Two spectacular images and bringing our vision to life. 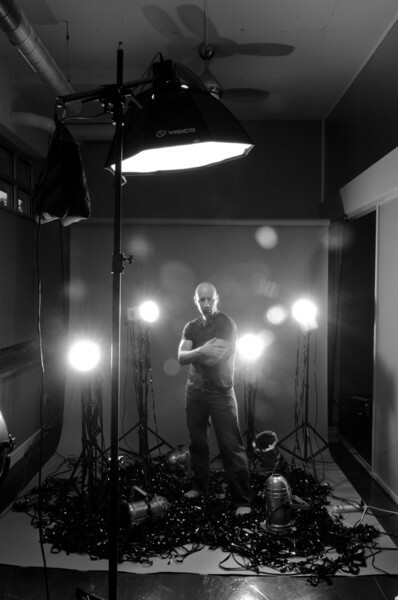 With my current move into a new studio, we asked Josh Eskridge to use his studio for the shoot. He was gracious enough to let us use his home and studio for the day. I have little studio experience, so this set would be a true challenge to overcome. Luckily Josh’s knowledge of studio lighting is unmatched in this region. While we waited on Taylor and the team to arrive we played with several setups for the first look until we found “the one”. An Alien Bee AB-800 with a Octobox diffuser directly overhead on a boom. One light. Taylor arrived, we made our introductions and sent her into hair and makeup. I left the room and let Tammy Wiseman and Scooter do their magic. Occasionally I would lean over and grab a peek. After the clean look was complete, I was ready and I was in love. This is everything I had imagined. I started by putting Taylor in the mindset of what I was looking for as far as posing; mechanical, futuristic, classy. Things started slow then eventually picked up the pace… click, pose, click, pose. Her expressions saw right through the lens. Taylor is as professional as they come, it was refreshing to work with someone that not only took direction well, but explored the boundaries of that direction. What I was seeing on the back of the camera was far better then I expected. Nearly 150 images later, I knew I had captured “the” shot. Onto the second look, this is where the real fun began. Tammy Wiseman, our hair stylist, really stepped up her game and just blew me away with her styling on this shoot. I was really pleased and I can’t wait to see what she does with the others. And well, Scooter’s makeup never lets me down! The second look was spot on, crazy and raving mad. In our meeting Scooter and I had came up with the idea to use film and crazy lighting to bring out the manic side of that particular look. 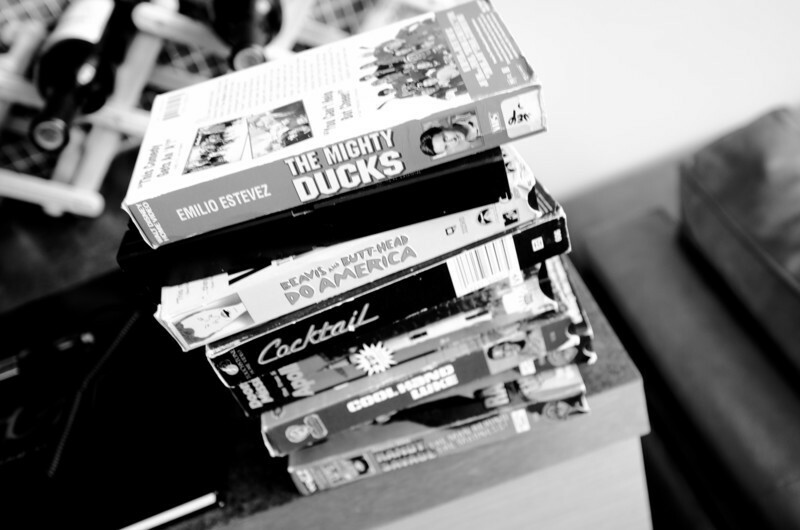 The day of the shoot I headed over to my parents house and grabbed 10 old VHS tapes from the depths of storage room. I also threw a bunch of my band’s stage lighting into a box, just for an added punch. In preparing the set for the second look, we broke the plastic covering and unwrapped all the tapes and threw film everywhere in the camera’s line of sight. At some point I had the bright idea to blow the film everywhere with a high-velocity fan, which turned out to be beautiful and annoying all at the same time. The film got caught in Josh’s fan not once, but twice, causing us to halt everything and unravel 15 feet of film tape from the fan’s under carriage. Nevertheless, the results were worth it. Taylor grabbed the handfuls of film and just like that, things worked, she was in her element. I couldn’t of asked for a better model to tackle this difficult vision. 30 images in and I knew I had it, but we kept going! It was too much fun. We eventually ended with a celebratory bash and I couldn’t help but show a few close photogs the results of the day over beers. These shots were probably the toughest and most interesting post process job I had ever tackled. I knew it had to be outer wordly, but I wasen’t sure how to do it. The first image came within a few hours, simple, black and white. But, the second image took a couple of weeks, I would edit, then come back to it, make some small changes, then come back a day later. I was just never happy, until I made a key change and decided to add the light trails with some swift photoshopping. I had never done anything like this and I didn’t know what response I would receive, but I was confident enough in my work to display it. I literally clapped my hands in success and knew it was ready for upload. Without further ado, I present the first set of 6 in “FICTION - A FASHION SERIES” from the like-minds of Scooter Ray and Clay Cook.